You will notice a trend on my blog that I am becoming increasingly anti-ideology. This is because I am observing a steep descent into ideology in our country and within the Church. Not the Church herself, but the people within it. This is largely destructive and causes division. Ideology is a type of heresy. It is to cling to a notion of something as ultimate truth, when ideology is typically our own blindness and proclivities. I had two experiences recently that continue to fortify my anti-ideological stance. First, I saw a National Review article recently that justified the killings of two civilians in a drone strike on the Afghan-Pakistani border in January. The moral gymnastics of the author made my stomach turn. The far Right has become a war-mongering machine and it is deeply disturbing. There are times when war is the final and just response, but not always. The killing of civilians is always deeply tragic and it is all the more tragic that no warning was given to these men or attempt at a rescue and the intelligence was bad. For both sides of the political spectrum in our country, “collateral damage” is a matter of statistics and numbers and matters little. This is a disturbing slide into a further dehumanization of others. I saw this from Congressional aides when I interned at The Heritage Foundation. On the flip side we have the ideological Pacifists, notice I said ideological. The Church has a long history of rightly ordered Pacifism, just as she has a tradition of Just War. These two seeming opposites are united under a fully formed understanding of justice. The ideological Pacifists cannot comprehend that war is sometimes the only option. They also seek to vilify members of our military, of which I was one. They say heinous things about Veteran’s even to the point of denying the necessity of the Church’s presence in a war zone or within the military. They cannot separate the war from the soldiers and the individual consciences of each service member, which is precisely what our last couple of Popes have done. The Church has not agreed with the past two wars, but has left the choice to serve up to the soldier. While I am with the Church on war, I did serve under President Bush for the Global War on Terror. There were things that I supported at the time for which I have sought absolution through Confession, but the people who serve in our military are not psychopaths, sociopaths, or any other name that is given to them. They mean well and have a desire to protect our country. It is easy now to forget how tumultuous the time was following 9-11. I know, I worked as relief worker following the Pentagon attack. Fear and chaos does not always produce the best results. This mitigates circumstances a bit. This is just two examples on opposing extremes that I have observed recently. This is also apparent in the “pelvic issues” as people try to do moral gymnastics around both Scripture and Sacred Tradition. Since ideology blinds us it hurts ourselves and the people around us. It inevitably puts us in a judgment seat, based not on our faith, but on our desire to conform others to our own beliefs. This is a great danger to the Church. As the secular culture encroaches more and more on our freedoms, it is essential that we make sure we are not a part of the problem. I am not trying to beat a dead horse. I am trying to warn people that we need to re-focus on what is important and that is bringing the world to Christ, not ourselves. I was an ideologue for a few years. I conformed my politics into my limited understanding of the Church. I could not see the whole. It created great tumult in my soul. There will come a day very soon when we may be asked to give account for our faith and we will be mocked and derided for it. Our faith cannot depend on ideology, it must be centered on Jesus Christ. If our ideology wins out, then we cannot possibly survive the test that will come our way. The secular attacks on the Church will continue to grow and become more virulent. Now is the time to arm ourselves with holiness through prayer, Scripture, frequent reception of the Sacraments, and true study of the Faith. Those are what will help us should we have to undergo the test. While I have my own theories on how bad it will get, what is certain is that Catholics will become increasingly more marginalized. That will be difficult. It is not easy to say “no” to the prevailing culture. It is not easy to lose family and friends because we cannot agree to the sexual ethics of our culture. We cannot stay strong if our faith is an empty shell that is propped up by our own ideology. I am not saying that we should not be involved in the public square, but we need to be prepared for our ability to participate to shrink greatly for a while. Honestly, we need to evangelize if we want to change the culture. This is the history of the Church. Our ability to operate in public waxes and wanes. There have been times of great persecution. There are times of great persecution upon the Church now. We are united to those Christians who are dying in the Middle East, Mexico, and in other places of the world. The Mystical Body is a communion that makes us a part of the same body as them. We suffer with them albeit not physically at present. The most concerning aspect of ideology is that it cuts us off from one another. It causes alienation and anger. I lost my temper at a completely nasty comment made about service members and its implications. I later apologized, but ideology is hard to combat. It is irrational and it automatically invokes an irrational response in others. We have to learn to control our emotions because we will confront virulent strains of ideology in the coming years, much worse than the two examples that I listed above. The best way for us to control our emotions is to re-focus on Christ and to prepare ourselves for whatever may come. If we rest in Christ and His Church, rather than our own power, then we can calmly deal with the attacks that come. 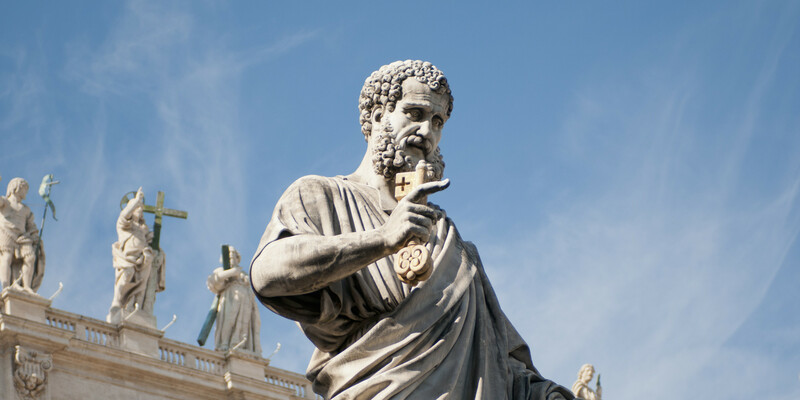 It won’t be easy, and like St. Peter and the other Apostles (except John), we may run for a bit, but if we continue to persevere and focus on Christ then we will make it to the end. As Catholics we must ask ourselves what the purpose and goal of our lives is as revealed by Christ. Why am I here? What am I supposed to do? The answer should be to follow Christ even unto Calvary. This is the horrifying, yet freeing, truth of our faith. When we are baptized we agree to enter into the mysteries of His life, including His death. Most of us will not be asked to be martyred physically, but most of us will suffer some form of persecution, even if it is locally from family and friends. We all suffer within the Mystical Body when others around the world are persecuted. There is no isolation within the Church. No one suffers in isolation. Ideology may be fascinating and create arguments, but it causes more division than peace and conversion. I have never been a Pacifist precisely because of the vilification of Veteran’s of which I am one. I am no longer a war-mongerer because I could see the horror of war up close through friends and family during my own service. I know from a few years of sexual relativism that the lies of the libertines do nothing but hurt and kill the soul. I know the joy and beauty of the Theology of the Body. The more I learn, the more I come to the center and desire to walk the tight-rope of the Church. She is the answer to the extremes of the world. She has the whole truth, not just the part we latch on to. I am sure that this topic will come up again on my blog because it is so important for the coming times. There is such freedom in abandoning our preferred ideologies. We are less angry. We don’t make other people as angry. We grow deeper in our understanding of the Church and Christ and we are able to focus on the life of holiness. I encourage each of you and myself, to look into our beliefs and make sure they are properly ordered to the Church. Let’s make sure that we are not vilifying other groups of people. This even means our enemies. Yes, they do evil and we must confront evil, but if we dehumanize others we very quickly run the risk of becoming like our enemies. Ideology is the quickest way to dehumanize another group of people by making them the “other”. Even in times of battle we must live as Christians. We pray for our enemies, pray for peace, and most especially, pray for the conversion of the world.